« Happy National Waffle Day! You really cannot go wrong with something that has the word “chocolate” in its name twice, can you?! I think not. I added a little something extra by putting some cinnamon in the mix. It adds an extra layer of flavor that I find wonderful, but if you are some kind of weirdo who doesn’t love cinnamon, by all means, leave it out. These would also be good with some kind of nut in the mix. Walnuts perhaps. Back to cinnamon- you will soon see that I am quite fond of cinnamon. If I was going to a desert island and could bring a few things cinnamon would be one of them. Yes, I would be sprinkling it on all of my desert island fruits and vegetables. Yum! Well, I am also very fond of muffins. I make them at least once or twice a week. I love eating one at 5am when my baby wakes me up. Typically, as soon as the sun rises I become hungry. I am also so delirious and tired that I cannot see a few inches in front of my face, talk, or think. But I can manage to smile and my little Lovebug and eat a muffin! I made these gems the other night when I was desperately craving chocolate. 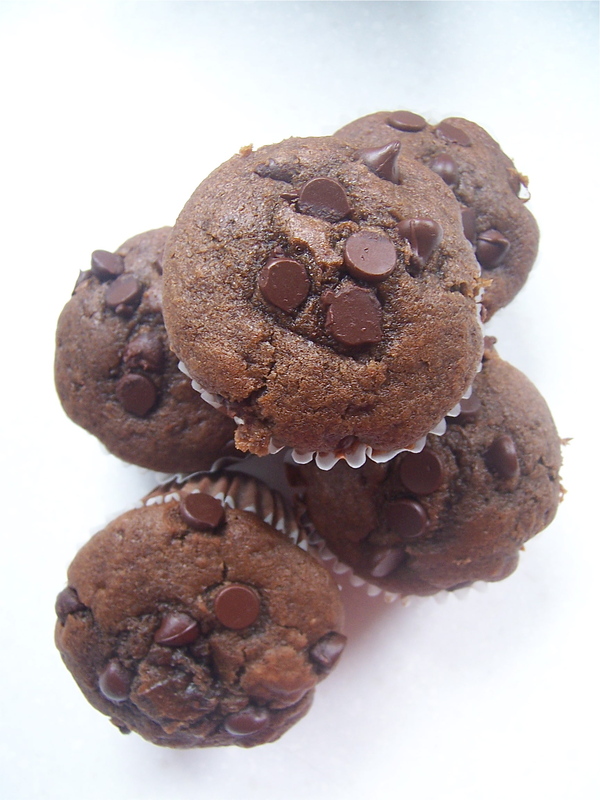 Cocoa powder and vegan chocolate chips were the only traces of chocolate in my house, so muffins seemed like a good way to satiate my sweet tooth. One reason I love them so much is that they are ridiculously fast and easy to make, something I really appreciate these days. This recipe is adapted from a Nigella Lawson recipe. I just love Nigella. I love her cookbooks. She is so poetic with her words and recipes. Her recipes are simple and always delicious without being fussy or complicated. She is very much about cooking for love- for the people you love, for the love of food, and for your own enjoyment. This recipe is so easy and will certainly fulfill your chocolate cravings. Oh, and so yummy with a cup of coffee! Preheat the oven to 375 degrees F. Prepare muffin pan. 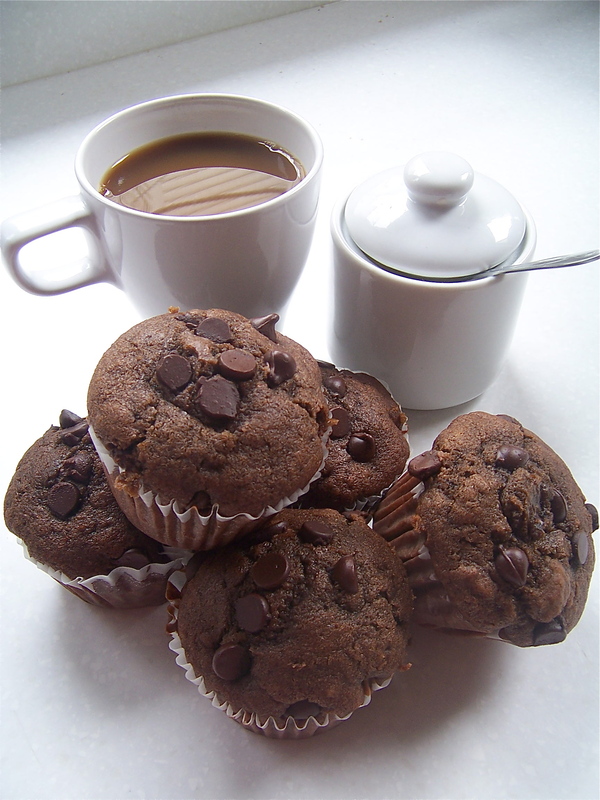 I always put a little oil on the muffin liners with a paper towel as it keeps them from sticking to the liner. Put the flour, baking powder, baking soda, cocoa, cinnamon, sugar, and 3/4 cup of the chocolate chips into a large bowl. Pour all the liquid ingredients into a measuring pitcher (think Pyrex). Mix the dry and wet ingredients together, do not overmix, a lumpy batter is good for muffin making. Spoon into the prepared muffin liners. I fill rather close to the top as I like nice high-domed muffins. Sprinkle the remaining 1/4 cup chocolate chips on top and then bake for 15- 20 minutes or until the muffins are dark, risen and springy.